Welcome to the May 2017 edition of the PXI Newsletter. Our intent is to educate and inform you about how the PXI standard is being used in modular test systems for a wide variety of industries. 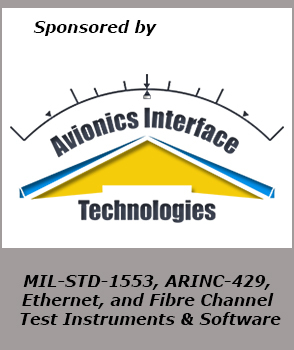 Our thanks go to Avionics Interface Technologies (AIT), the sponsor of this month's issue. the channel count of expensive instrumentation while increasing the flexibility and repeatability of your measurements. The following table outlines the strengths and weaknesses of all four switching architectures. Achieving high volume production test or R&D prototype test of high-speed interconnects, such as cables, backplanes, PCBs and connectors requires a fast, automated physical layer test system. Engineers need a test system that can keep up with the latest technologies and use leading edge test equipment and software. Fast paced manufacturing test requires a system with user definable flexibility, and a user-friendly interface to simplify test configurations and execution for signal integrity engineers. Breakthrough technologies have increased computer and network system’s data rates resulting in interconnection design updates adding to the complexity of physical layer test. This article describes the challenges and needs for physical layer test today and in the near future. Signal integrity engineers are discovering new test challenges as the development of next generation computer and communication system exceed data rates of multiple gigabits per second. Processors and SERDES chip sets, within these systems, are expected to operate beyond Giga hertz clock frequencies. Demand for higher data rates resulted in several physical layer design changes including signal routing for higher data rates and higher bandwidth per pin in high-speed serial bus designs by transitioning from parallel bus structures to serial bus structures. Design engineers are also implementing differential circuits instead of single-ended circuits in order to maintain channel signal integrity, minimize effect of cross talk, and enable maximum data rate throughput. NI PXIe-54x3 Arbitrary Waveform Generator FamilyThe new PXIe-5413, PXIe-5423, and PXIe-5433 arbitrary waveform generators deliver -92 dB of spurious-free dynamic range and 435 fs integrated system jitter while providing precise waveform adjustment when used with a dedicated standard waveform generation engine. The high performance M9336A PXI AWG provides creation for complex wideband waveforms with three 540 MHz bandwidth channels, 16-bit resolution, and 1.28 GS/s in a single slot module.